As eLearning designers, we have to understand adult learning psychology to create courses that appeal to them and make them want to learn what you want to teach. But... there is a challenge. Most adult learners are anxious about being able to adapt to, and perform in a virtual learning environment. They also harbor negative attitudes about eLearning (due to bad courses they’ve taken in the past). We have to overcome these obstacles by giving the learner compelling reasons to take our courses. 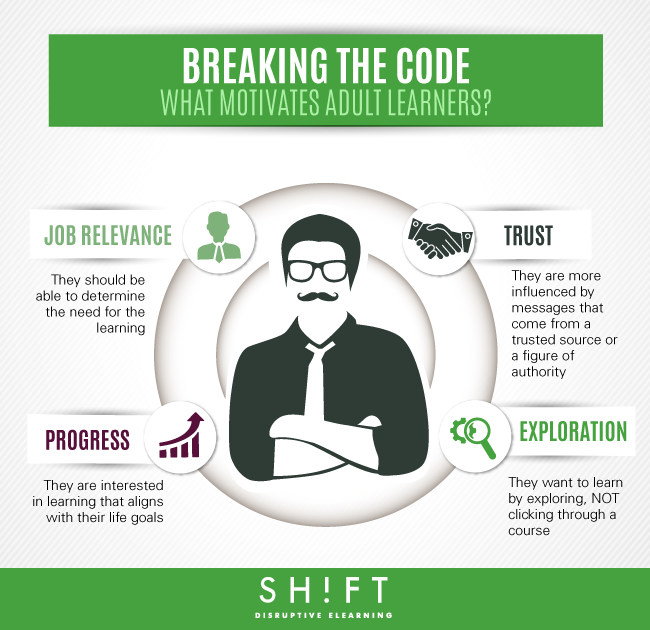 We have to get inside their minds and break the code: What motivates them to learn and what holds them back? He/she is an individual who performs one or more “adult” roles, as has been deemed by society. These roles include that of an employee, spouse, parent, a citizen who is aware of his rights and duties. He/she is an individual who believes that he/she is responsible for what happens to them and wants to take charge of their own life. This means your learners are adults with previous knowledge and fixed ideas about what works for them. They are busy and stressed-out folks who hate wasting time. They want learning experiences that HELP THEM meet their needs and achieve their goals. The Golden Question: What Motivates Adult Learners? 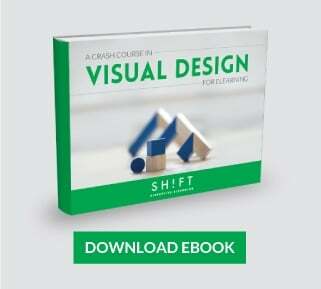 You have to persuade adult learners to rearrange their busy schedule and make time to take your eLearning courses. But it is easier said than done. Motivating adult learners can be quite a challenge unless you know what makes them tick and what compels them to prioritize and take action. Adult learners are almost always taking an eLearning course for a specific purpose rather than just for fun. Step into their shoes to understand their needs and aspirations. Also, consider the demands of their jobs, so you know exactly what skills they need to excel in their professional duties. Focus on giving them what they want: answers to their real-world problems. Adult learners appreciate working towards clearly-defined goals (this is their main motivator, and that’s why training must be short, relevant and useful). They hate the feeling of running around in circles and quickly become frustrated. Especially, they don't want to waste time on eLearning courses that will not provide any real-world transferable, applicable knowledge or skills. Begin every module by stating the learning objectives clearly. Explain in detail how to carry out an activity. Use analogies to relate new ideas to what learners already know. End every module by reinforcing the learning. Make sure all relevant information is visible and easily accessible, and there are no obstacles that keep your learners from reaching their goal efficiently. According to Teresa Amabile of Harvard, the lure of progress is a powerful motivator in adults. Adult learners’ are interested in taking an eLearning course only if the learning aligns with their life goals and lets them advance in their career. They are motivated to engage with your eLearning course if you reveal to them what they can achieve by the time they complete it. Employees who believe that their employers have their growth in mind will be more motivated to take an online course than those who feel they are treated as commodities in their organizations. Incorporate videos of successful people or relevant experts related to the subject. Give students the opportunity to constantly self-assess their progress and understanding of a subject. Offer feedback to boost their efforts and encourage them in completing a task. Provide a concrete proof of completion such as a certificate. 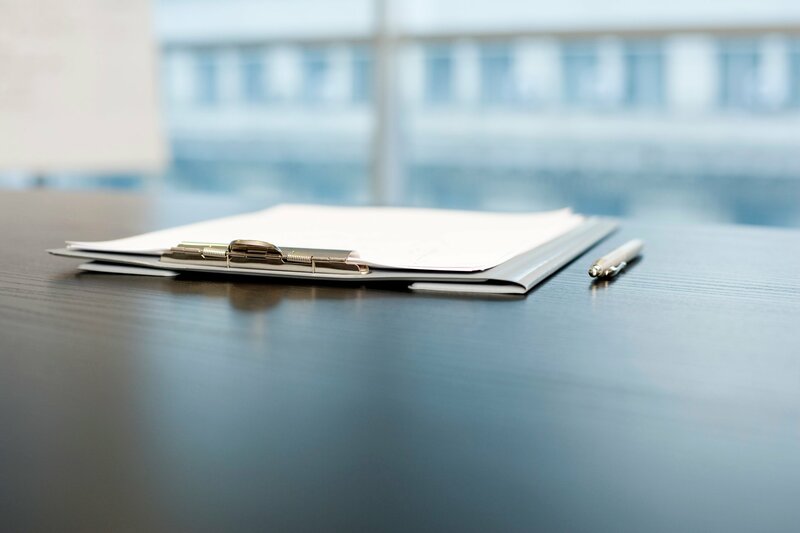 Build levels, grades, or other types of rewards and recognitions in your course to give the learner the gratification of knowing that he or she is making progress at the workplace. Trust is a powerful tool for motivating people. Adults are not as trusting or naïve as children. They will believe in your message only after you have earned their trust and established yourself as someone who knows what is talking about. When learners trust the online instructor (or the source of the content), they will likely invest time in completing the training. Otherwise, they'll easily walk away. Sound and/or read like friendly advice or the wise words of a counselor. Have clear requirements, or a pre-course preparation if necessary. Provide different levels of support from online instructors. Design clean and professional-looking courses. Studies show people don't trust badly designed websites. Adult learners are self-directed individuals who want to control the way they lead their lives. They want to be involved in and experience the learning first-hand. Exploration is a powerful motivational tool. You should create eLearning courses that engage learners the way they are hooked to their favorite TV show or feel compelled to carry on reading a book or playing a video game. Charles Jennings said it clearly "Think experience, practice and sharing rather than content, content, content." Consider gamification. When you set goals, throw in challenges, and provide rewards, learners will be instantly hooked. Offer several opportunities for them to participate. Invite them to solve a problem or a mystery. Storytelling: When you weave your content within an engaging story, your audience will gobble it up. Stories feel more realistic than charts and statistics. Provide learners a level of individual control as they complete the course. For example, provide them the possibility to choose the order of topics or areas that they can explore. Create activities and assessments that make the learner think. Adult learners love nothing more than to connect the dots, find patterns, and figure out the answers themselves. Make use of their previous experience. A simple “what if” exercise can effectively help you achieve this. Now that you know how the adult learner thinks and expects from you, you can design a truly motivating eLearning course that will answer his or her questions, resolve his or her issues, and empower him or her to build a better life. The adult learner has enough responsibilities and burdens on his shoulders; create a course that is his ally.